The theme of this year's International Women's Day, Inspiring Change, is appropriate at a time when the role and influence and future of women are changing rapidly. From Cairo to Kiev, from Washington to Juba, women have been at the forefront of changing history. Like so many others, we celebrate International Women's Day, but we do so with an eye toward the women of the future. Girls around the world are now receiving the attention and recognition they deserve, thanks to groundbreaking projects (like The Girl Declaration) that amplify their voices and concerns. But more work must be done to break down social and cultural norms -- such as child marriage, trafficking, and limited educational opportunities -- that prevent girls from growing into strong women. As we seek to nurture children into becoming responsible, caring citizens of the world, we must be sure to not leave girls and young women behind. At The Global Fund for Children (GFC), we see girls and young women inspiring change on a daily basis in hundreds of communities around the world. Girls everywhere are participating in programs that enable them to improve their own circumstances, equipping them with the skills, tools, and education they need to strengthen their families, communities, and countries. In Kitgum, Uganda -- which borders South Sudan -- the literacy rate is about 43 percent, with girls constituting the majority of those who are illiterate. Adolescent girls have been particularly affected by the area's 20-year-old conflict; they are often denied opportunities to attend school and sometimes abducted by rebel soldiers. GFC grantee partner Children of the World Foundation offers girls a second chance at education and trains young women in livelihood skills. 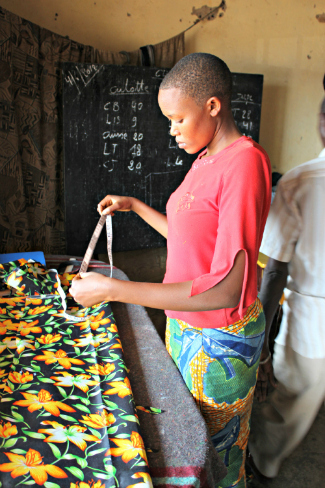 Upon successful completion of an apprenticeship program, the young women receive support to start their own businesses or find jobs. This is significant: Where women's participation in the labor force grows fastest, the economy experiences the largest reduction in poverty rates. In 2005, a group of young women in Villa El Carmen, a rural area of Nicaragua, established Asociación Movimiento de Mujeres por Nuestros Derechos Humanos (MOMUNDH) to combat widespread violence against women in their community. In addition to working with survivors of domestic violence, MOMUNDH empowers vulnerable children and youth to stand up for their rights. The organization helps its young beneficiaries gain self-esteem and leadership skills through art classes and soccer lessons and also runs an innovative trafficking prevention program that teaches adolescent girls how to safely use the Internet, email and social media. Across the globe, we have seen the power of education, mentoring, sports, the arts, leadership and job training to elevate the status and well-being of girls. Many of these programs are inspired by girls and young women who seek to improve their own lives and those of others. Ultimately, these girls do not just inspire change -- they are the change. And they will grow into women who implement change, making their impact long-lasting. As we celebrate International Women's Day this year, let's resolve to elevate girls as they sow the seeds of greatness.